When it comes to Halloween, you can never be too careful...there are dangerous creatures about! Goblins haunt the eaves of every house on your block. Previously pristine front lawns turn into graveyards. Zombies populate the subway. And witches cast their spells on unsuspecting passersby. But there is a magical amulet, one few people know of, known to ward off evil spirits and creepy creatures of the night. The eyes of a pure, black cat! Now, of course, real cat's eyes are a) disgusting to wear and b) highly unethical. But luckily, the spirits don't know these Cat Eye Earrings from the real deal. So there you have it! Dangle this pair from your lobes and you won't need to worry about being haunted this Halloween! 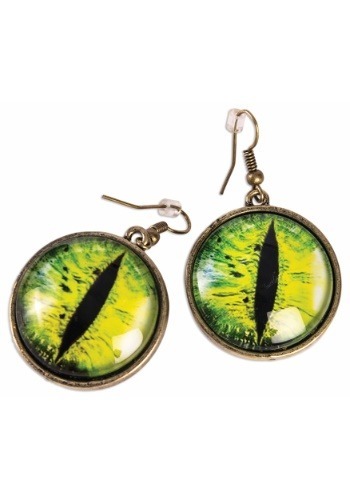 This pair features metal hooks and round replicas of green cat eyes, guaranteed to cause a double-take from anyone who sees them. As effective as garlic to vampires, these helpful earrings will ward off all things unwanted, including those houses who buy toothbrushes to give out to trick-or-treaters, instead of candy. Of course, you can tell all your pals about the power of these cool earrings. Or, you can keep the secret to yourself. After all, sometimes things feel more magical when they're rare!